Progressive Charlestown: What the Trump? It’s not as if Donald Trump doesn’t occasionally deliver a head-scratcher. In fact, Trump’s staff of media surrogates spend most of their time not advancing the case for some policy proposal, but acting as translators for his latest gibberish-burst. Trump’s regular production of nonsense, counter-sense, anti-sense, and plain old hate speech is so high that most of the media has long become inured to the idea that each day would see a verbal Trump land in the punch bowl. His father was born in Germany. "My father is German. Right? Was German. And born in a very wonderful place in Germany, and so I have a great feeling for Germany." Fred Trump was born in the Bronx in 1905. The noise from windmills causes cancer. After claiming that living “anywhere near a windmill” drops property values 75 percent (it doesn’t), Trump wasn’t sure that he had made power from something that doesn’t burn a fossil fuel sound scary enough, so then he added on. “They say the noise causes cancer.” In this case “they” are clearly idiots. The 2018 midterms were rigged. The oranges of the Mueller report. 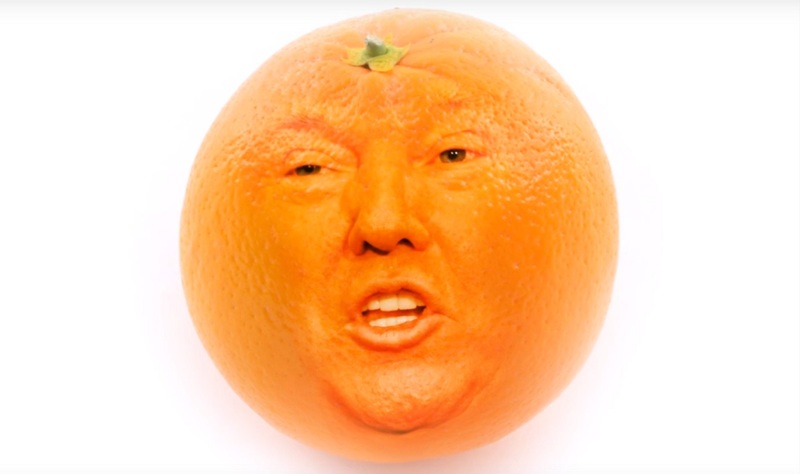 In a meeting with the secretary general of NATO, Trump told reporters that they really needed to look into the “oranges” of the Mueller report. Then he did it again. Then he did it again. “I hope that they now go and take a look at the oranges, the oranges of the investigation.” While it was hilarious at the time, misfiling the word “origins” turns out to be the least-odd statement of Trump’s day. Someone is going to leak his speech to the media. Trump’s speech at a Republican fundraiser was carried live on C-SPAN, various media sites, and attended by the White House press corps. All of which needs to be said just to make it clear how Trump Trump’s statement that "Someone's going to leak this whole damn speech to the media" really was. Windmill noise does not cause cancer. No kind of noise causes cancer—not even listening to Trump. Though coal dust, coal smoke, and coal ash … those things absolutely can cause cancer. But the windmill thing wasn’t the most over-the-top statement from the paranoid man with German oranges. And it wasn’t even Trump’s statements about how he could make a profit by shutting down a billion dollars a day in business on the southern border. Or reversing himself on the same topic. During the same GOP fundraising speech, Trump suggested that he might change his catchphrase for the 2020 election. Rather than MAGA, Trump declared, "We'll be the party of health care. We shouldn't run away from health care." Then he went on to explain how he wrangled with Mitch McConnell and convinced him to run away from health care. Though, to be fair, Trump actually said “hett care,” and no one knows what that is, so maybe he’s doing it well. But didn’t he say exactly that in 2016? Someone needs to go back to the oranges to be sure.